Today marks the official launch of our Lazy Oaf x Kickers Shoe Collection now available online. 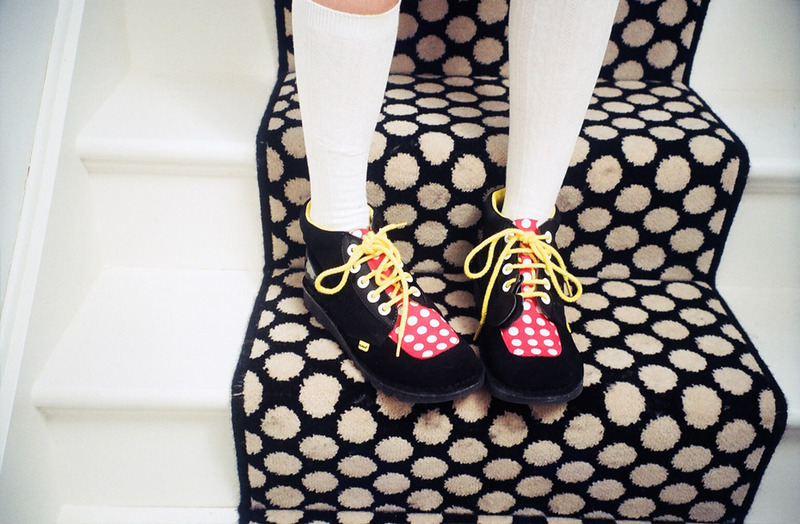 A fan of Kickers from her childhood in the nineties, our designer Gemma Shiel was very excited about designing this range of shoes which combines Kickers classic shape and signature detailing with Lazy Oaf's playful prints and pop colour palette. This 5 piece range includes sparkly Kick Lazy Glitter Boots in black and mulit-colour, the polka dot Kick Lazy Dotty, the patent Kick Lazy Brogues with detachable fringing and bows and the statement design, the Kick Lazy Lite's with layered rainbow stack wedges. You can see images from our look book below. Photography: Masha Mel; Styling: Tess Yopp; Models: The Bloom Twins; Hair and Make-Up: Laura Barrow. Kick Lazy Glitters in Multi and Black. You can see the complete lookbook here.